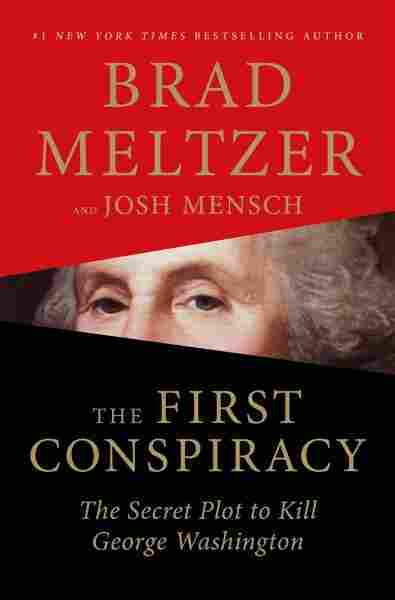 'The First Conspiracy' Details Foiled Hickey Plot To Assassinate George Washington Thriller author Brad Meltzer and documentary producer Josh Mensch offer an intriguing look at a true-life, foiled plan that, had it succeeded, may have killed the American dream before it even began. In 1776, the governor of New York and the mayor of New York City conspired to assassinate George Washington. And it might have succeeded if it weren't for a would-be counterfeiter and an iron mill foreman. It sounds like the plot of a mildly implausible historical thriller, but it actually happened and it's one of the more remarkable stories to come out of the American Revolution, even if it's not one you learned in history class. The bizarre plot is the subject of The First Conspiracy, the fascinating new history book from thriller author Brad Meltzer and television documentary producer Josh Mensch. It's an intriguing look at the so-called "Hickey plot," the foiled conspiracy that, had it succeeded, might have killed the American dream before it even began. The book takes place in 1776, during the first months of the Revolutionary War. Independence from Great Britain was far from a fait accompli in those days; indeed, it was considered the longest of shots — the British armed forces were some of the most powerful in the world, while the American army, populated by "untrained neophytes, hayseeds, and former criminals," was very much not. The colonies' best shot at independence relied on the military prowess of George Washington, whom the Continental Congress named commander in chief of the young, ragtag military in 1775. Washington shocked the world when his army took Boston in 1776, after which the war moved to New York, which was seen as a British stronghold with a large number of loyalists. The rebels were always doomed in the city, but the governor of New York, William Tryon, and New York City Mayor David Mathews, both Tories, didn't want to take any chances. Tryon hatched a plot to either kidnap or assassinate (the goal, Meltzer and Mensch acknowledge, was vague) Washington, thereby demoralizing the already disheartened Americans. It was, the authors, write, "a clandestine plan to strike a knife into the heart of the rebellion." It also wasn't a particularly good one. Despite recruiting some of Washington's "Life Guards" — soldiers who were responsible for personally protecting the general — it was foiled thanks to its participants' inability to keep a secret. Two of the guards, jailed for possessing counterfeit money, spilled the plot to a cellmate, who had been arrested in a separate counterfeiting scheme. And an iron mill foreman, sent by his boss to track down some AWOL workers who were also in on the conspiracy, uncovered more details about the plan after pretending to be a British loyalist. "The discovery of this plot, and the effort to investigate it, led colonial authorities to devise new systems of intelligence gathering and counterespionage. In many ways, this strange plot against George Washington would lead to the establishment of a whole new field of American spy craft — now known as counterintelligence." It's a fascinating story, and Meltzer and Mensch do an excellent job explaining it. Meltzer is the author of a dozen thrillers, and he brings a propulsive energy to the narrative — it can be difficult to create tension and suspense in a nonfiction book where the reader already knows how the story ends, but the authors do a great job keeping the reader turning the pages. The book is also extremely well-researched. Meltzer and Mensch cite an impressive number of primary sources, including letters from Washington and others, as well as a heroic number of history books. Nothing about the book is phoned in; the amount of research behind it is genuinely remarkable. If there's one thing that doesn't quite succeed, it's Meltzer and Mensch's prose, which at times tends toward the breathless. Writing about Tryon, for example, the authors declare, "He has money. He knows the city as well as anyone. He has friends in high places ... and low places." And on the Declaration of Independence, they write, "In a few days, the Congress will vote whether to ratify this document — and potentially change the war ... and the world ... forever." These kind of sentences, which always come at the end of their chapters, sound like a narrator of a television series dramatically teasing the next segment of the show right before a commercial break. But that's a minor complaint — it's easy to overlook the occasional histrionic writing when the story is so fascinating. And you certainly can't accuse Meltzer and Mensch of being bloodless or boring. The First Conspiracy is an excellent book, enthralling and beyond fascinating, and it's sure to delight both fans of thrillers and American history.